ODM. Why Is The Excavator Breaker Work Weak? Today Agriculture Excavator Manufacturer to come to summarize Why is the excavator breaker work weak. The internal leakage of the excavator breaker is characterized by high noise during operation and higher engine speed, the greater the noise; many copper scraps are visible in the oil filter. The gear pump should be disassembled to detect the end face clearance of the gear, the radial clearance of the gear, and to see if the seal is outstanding. If there is any tolerance or damage, it should be corrected or replaced. The main reasons for the leakage inside the distribution valve are: the main spool of the total safety valve is stuck; the cooperation gap between the valve stem and the valve body is too large; the triangular breaker or the valve body is strained; the seal is damaged. At the pressure point of the distribution valve, the pressure gauge with a range of 25mpa is connected, so that the engine and hydraulic oil are operated at the normal operating temperature and the engine speed is about 1 800r/min, and the distribution valve rotary valve is operated to make the bucket backward. The pressure displayed on the gauge should be 17mpa. If it is lower than this value, the safety valve should be dismantled to see if the pilot valve spring of the breaker assembly is cracked, the seal is outstanding, the main spool is stuck, and the orifice is blocked. When there is no problem above, adjust the pressure regulating screw to make the system pressure reach the normal value. The piston of the boom cylinder or the rotary cylinder is respectively received, and the rodless cavity oil pipe is removed so that the rod cavity of the boom cylinder or the rotary cylinder continues to be filled with oil. If there is more oil leakage from the rodless port (normal leakage should be ≤30ml/min), it is clarified that the piston seal ring is damaged and should be replaced; it can also make the bucket full load and lift to the limit position. The boom lever is placed in the neutral position and the engine is turned off. The boom's sinking speed (<40mm/h when normal) is investigated. Then, the boom lever is placed in the ascending position, if the boom sinks at this time. The speed is significantly accelerated, clarifying that the internal leakage occurs in the hydraulic cylinder; if the change in the sinking speed is not significant, the cause of the internal leakage is explained in the distribution valve. 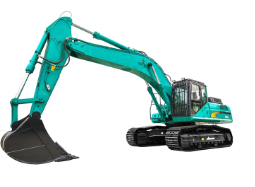 At our company, You always could get your favorite combination set of Civil Construction Excavator sjm_jck@hbxg.com. Next What Should The Excavator Engine "boiling"?